Reminiscences of a Pendle Hill teacher who was helped by Quaker relief workers and then trained others to serve abroad under the American Friends Service Committee. 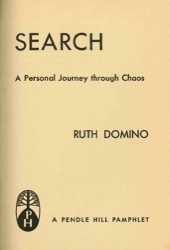 Ruth Domino (later Domino Tassoni) was born in Berlin in 1908. When she fled the Nazis in 1940, she unexpectedly ended up at Pendle Hill. The Mexican Government had originally offered her asylum, but her ship came to the United States. She taught German to relief workers on campus during her tenure as an instructor at Pendle Hill. In 1950, she returned to Europe. In addition to her Pendle Hill pamphlet, she wrote several books, including A Play of Mirrors, a collection of poetry in Italian. Daniel Hoffman recently retranslated that work. She also published three volumes of short stories in German, her native language.